There will be plenty of BRDC representation this weekend (11-13 September) as the Le Mans Series heads to the home of British motor racing for the Autosport 1000kms of Silverstone. Following their podium finishes in Nürburgring both Full Member Darren Turner and Full Member and Superstar Stuart Hall will continue their roles with Aston Martin in the LMP1 category as the marque looks to secure the championship 50 years after taking the World Sportscar Championship title. Also in the LMP1 race is Superstar Andy Meyrick who will be looking to follow up on his fourth place finish at Nürburgring in the Audi R10 TDI while Danny Watts will be out with Strakka Racing in a Ginetta Zytek. BRDC Vice President, Nigel Mansell OBE, will team up with his son, BRDC Rising Star Greg, for their first time in LMP1 and Ginetta Chairman and BRDC Full Member Lawrence Tomlinson in the Ginetta-Zytek GZ09S. In the LMP2 category, Mike Newton will be on track for RML in a Lola B08/80 Coupe while Jonny Kane will be driving the same car for Speedy Racing Team Sebah. Ryan Sharp returns to Silverstone, having raced here earlier in the season in the FIA GT. 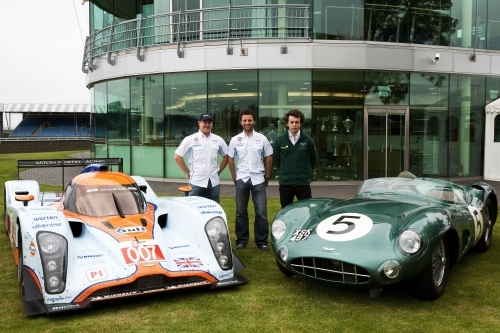 The BRDC Full Member will be in an Aston Martin DBR9 in the LMGT1 class. Paul Drayson and Rob Bell will be racing in the LMGT2 category for Drayson Racing and JMW Motorsport respectively. Although not racing, David Brabham will be at the circuit with fellow American Le Mans Series competitor and BRDC Full Member Marino Franchitti. David will be speaking to VIPs about his Le Mans 24 Hours win earlier in the season as part of his Racing4Charity organisation.